Ambien and it's extended release version, Ambien CR are the brand names for the generic drug Zolpidem. The medication is a sleep aid and is used by patients who are unable to fall asleep (Insomnia) or stay asleep. It has a non-narcotic formulation, but it is a controlled substance nonetheless. This medication works on the central nervous system. More specifically, Ambien is thought to increase the production of certain chemicals in the brain that induce sleep and help people stay asleep throughout the night. The FDA approved Ambien in 1992 as a prescription drug and it is available both a generic drug and as a brand name drug. There are thirteen pharmaceutical companies that currently manufacture and distribute zolpidem tartrate tablets in the U.S. These companies include Apotex Inc., Caraco Pharmaceutical Laboratories Ltd., Carlsbad Technology Inc., Dr. Reddy's Laboratories Ltd., Genpharm Inc., Lek Pharmaceuticals, Mylan Pharmaceuticals Inc., Mutual Pharmaceutical Company Inc., Ranbaxy Laboratories Ltd., Synthon Pharmaceuticals Inc., TEVA Pharmaceuticals USA, Roxane Laboratories Inc., and Watson Laboratories Inc.
Ambien (Zolpidem) should not be used for periods of more than four or five weeks unless directed by a physician since withdrawal symptoms can and often will occur if the drug is used for longer periods. Ambien is available in 5mg and 10mg tablets or 6.25mg controlled release tablets (Ambien CR) for people who are unable to stay asleep longer than a few hours at a time. It is not available in liquid form. Ambien CR works just as the original version does, but contains an additional layer of Zolpidem which is released in a controlled manner allowing the patient to stay asleep longer. Your healthcare provider will determine which drug formulation is best in your situation. Although Ambien (Zolpidem) is approved for use in people who have difficulty falling asleep or staying asleep, or Insomnia. It is important to understand that everyone has trouble sleeping at some point during their lives. 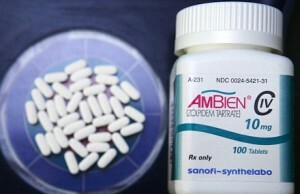 People who have more than three or four nights of insomnia in a row on a regular basis are good candidates for Ambien. People using this medication for more than two or three days in a row may have a higher likelihood of experiencing the more severe side effects of Ambien, so patients should use this medication at the lowest effective dose and for the shortest period of time possible. Aside from the purposes listed above, your healthcare provider may prescribe this drug for other medical purposes. For example is might also be prescribed to people dealing with grief for its sedative effect and ability to relax the mind. Read the prescription label carefully before initiating this drug. If you do not understand the prescription or have any questions, ask your healthcare provider. Take Ambien orally on an empty stomach or hours after consuming your meals as instructed by your healthcare provider. It is best to take it right before getting into bed. Do not take Ambien during normal waking hours or if you do not have enough time for a full night’s sleep (7 to 8 hours). You may experience some memory loss if you wake up before that time. Dosage depends on your medical condition, other drugs you currently take and your response to the treatment. Do not adjust the dose or take more than prescribed. Swallow the extended-release tablet whole with a full glass of water. Do not chew, crush or remove the cover of the tablet. Do not drink alcohol or take other sleeping pills along with Ambien. Combining these substances is associated with getting up out of bed while not being fully conscious such as sleep-walking, sleep-driving, talking on the phone, etc. Do not discontinue taking this drug without consulting your healthcare provider. It can cause withdrawal symptoms if suddenly stopped. Contact your healthcare provider right away if you have more difficulty falling asleep even after taking this medication.